Did you know that “The Happiest Place on Earth” can actually be one of the Fittest places on Earth? 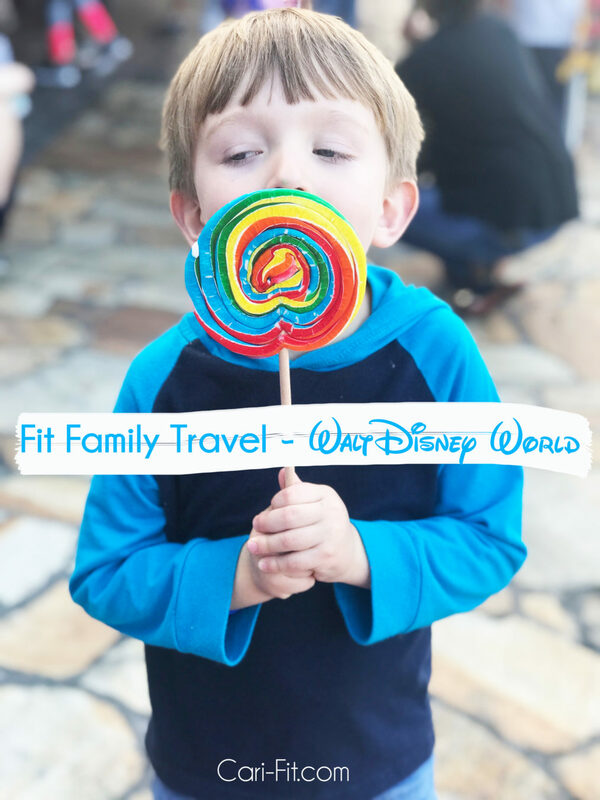 Walt Disney World and their resorts actually offer many options for healthy families who want to stay fit and healthy while on vacation. If you make some healthy dining choices and combine that with all the walking you will do – it might be one of the healthiest vacations you take! This was our second time to go with our son and first time with out daughter who is almost 2. 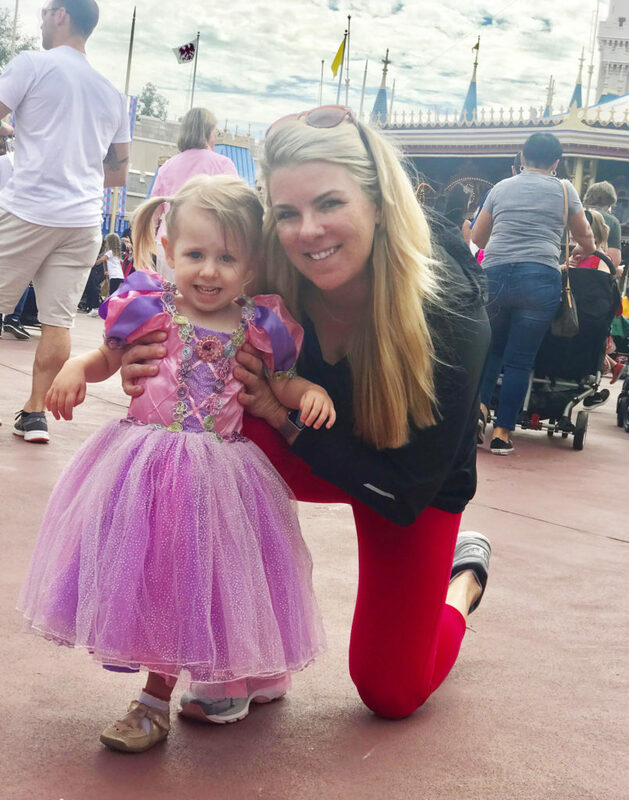 I’m in no way a “Disney Expert” but I think after going with young children twice – I’d share some of my best tips for families with small children. 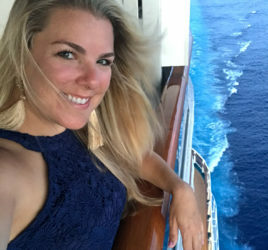 Also, as a fitness blogger – I want to share some tips on how you (and your kids) can eat healthy and squeeze in some workouts so that your trip ends up being a fun AND fit one for the whole family. This is a long post (sorry) so feel free to skip around and be sure to check out Disney’s recipe (they sent it to me!) for a great healthy quinoa salad at the bottom! Comfortable clothes, walking/running shoes and layers. It’s usually pretty warm in Florida but you don’t want to end up having to purchase extra bulky layers at the theme parks if you don’t have to. I wore workout clothes a couple of days and comfortable jeans with a workout tank and light jacket on other days. You also need walking shoes – for the whole family. We literally walked 6 miles one day at Magic Kingdom, so you don’t want to be in new shoes or ones that won’t hold up. Snacks. Disney has a lot of dining options (more on that below), but I recommend packing a few healthy things in your suitcase and then also bring some of them along at the theme parks. For me, I like healthy bars like LaraBar, ThinkThin, RX Bar, etc. and for my kids I packed extra food pouches (ones with veggies are good because theme parks are usually lacking in veggies), goldfish and other small snacks. I also brought along some protein powder packets to mix in my water bottle. Most likely your hotel will have milk if your kids drink milk – or I recommend packing (or buying once you land) a package of milk like the ones from Horizon that don’t need to be refrigerated. We always request a room with a refrigerator so we can store milk, snacks, etc and if your hotel doesn’t supply them automatically they sometimes will give them to families with babies at no extra charge. Also, be sure to bring your kids favorite milk cups, sippy cups and bottles. Cleaning supplies/sanitizer. I usually pack an unscented soap and small bottle cleaner (for cups too) so I can wash them regularly at the hotel. Theme parks are loaded with germs – so it’s good to wash your cups and bottles every day! I also bring lots of sanitizer wipes (for planes, busses, etc) and gel. I also bring my own laundry detergent and sometimes wash a few things in our bathtub. If you use the community washer/dryers just make sure to wash your clothes on hot to kill the bacteria from the previous person’s clothes (yuck). Sunscreen. Because of the time of year we went – the UV rays weren’t too bad but I brought mini sunscreens like these with me. I also brought sunglasses and hats for me and the kids. I usually wear spf in my moisturizer – (I use either Aveeno, Charlotte Tillbury’s Magic Cream with SPF and/or Tarte’s 12 Hour Foundation with SPF. A Good Stroller. Depending on the age of your children – I would highly recommend a good double (or single if you have one child) stroller. I love my double UppaBaby one because it’s lightweight but also the seats recline for naptime – since you probably won’t be back at your hotel for naps. 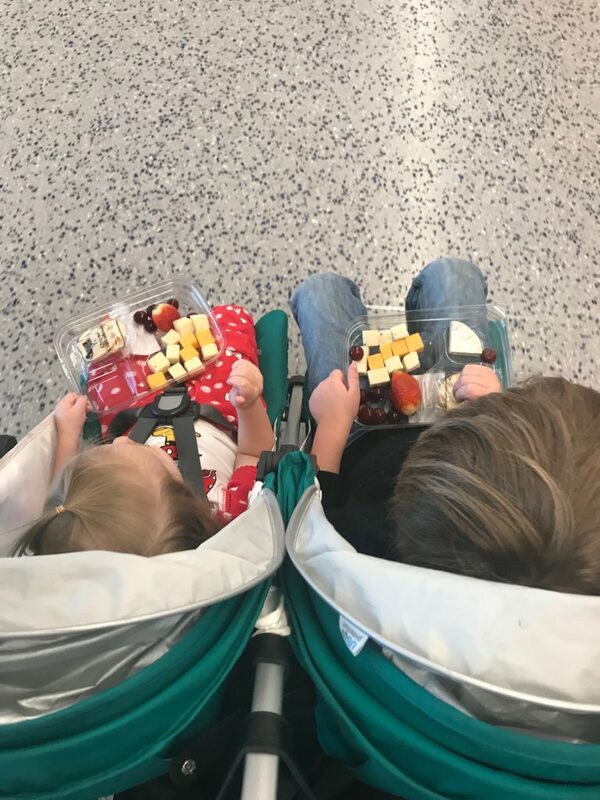 Snacks and a Double Stroller Are Key! This was our second time to stay here as a family. Surprisingly it’s not an actual “Disney Resort”. There are some perks at staying at a Disney Resort such as using the magic bands to unlock your hotel room, the abundance of shuttle busses to take you to your hotel and also take/store your luggage, etc. BUT, I really loved the Swan and Dolphin. It has the perfect location, the rooms are great, dining is very kid friendly and you still get free shuttle busses to all of the Disney parks. We stayed at the Dolphin but got to use the amenities of the Swan which is directly across (they are connected by a walkway). Rooms: We just had a normal Deluxe room with 2 beds and also a crib. The last time we stayed we had a suite which was nice. They also have “family rooms” but these were sold out when we visited. Their rooms are updated and very nice with modern decor. We had a coffee machine and refrigerator and I liked having the sink outside of the tub/toilet area. 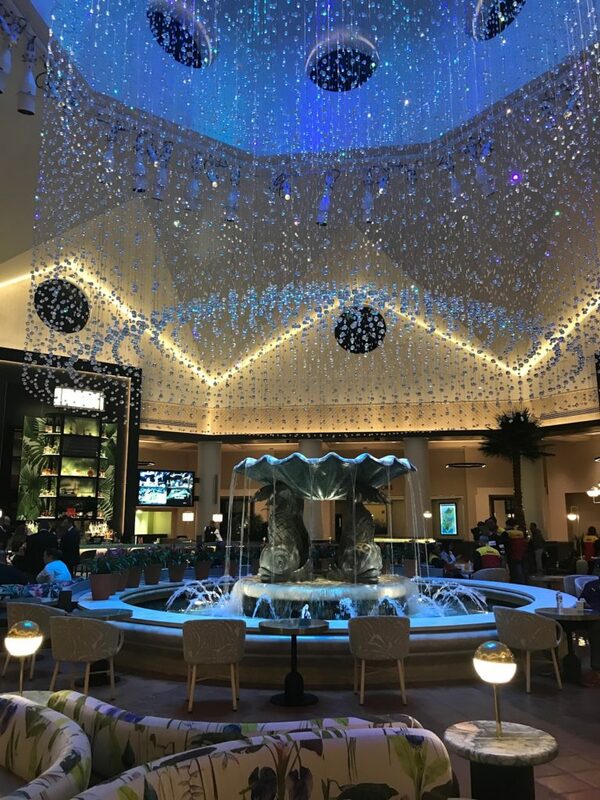 Dining: Dining is expensive when you go to Disney – period. Be prepared to spend more than you would at home or even some other resorts/hotels in the US. But, with that being said – the Dolphin had lots of great options for families. They have a new Fuel market that offers many healthy items for breakfast, lunch and snacks. We went here daily to stock up on fruit, bars, yogurts and usually got coffee and breakfast sandwiches to eat on the bus on the way to the parks in the mornings. They also have a cafeteria style restaurant in the basement that even made me hardboiled eggs one morning. Most of our lunches and dinners were at the Disney theme parks. Fitness Amenities: The Swan and Dolphin has excellent fitness facilities. The Dolphin’s gym has been newly updated and has a large cardio area, a fitness studio room and another whole room with weight machines and free weights. It’s very large (and clean) for a hotel gym. Every morning I was there I got up early and went for a run. The running path is awesome and they have many routes available for you (there is a map out front of the gym) depending on how far you want to go. I usually just did the 2 or 3 mile loop that took me around the Disney Boardwalk and waterways. I would highly recommend it. Then, on our last day there I went across to the Swan hotel and tried one of their Pelotin bikes. I was so glad they had one because I have been wanting to try a “class”. I thought the workout was great and will do a review on this soon. Their gym was also nice but smaller than the one at the Dolphin. They also have a lap pool there – but the Dolphin has amazing pools (see below). If your hotel doesn’t have a good gym and you don’t want to go outside – you can try these sample workouts to do in your hotel room. Family Amenities: The Dolphin has daily activities for the family ranging from story times, scavenger hunts and even s’mores out by the pool. Unfortunately, we didn’t participate in many of these because we were at the theme parks most days. The Dolphin has amazing pools! All of them were heated so even though it was still cool outside, we were able to swim. They have a kids pool (with shallow areas), a larger pool with grotto and large slide and also a lap pool with cabanas nearby. The pool food/drink service was great and they allowed me to swap fries for fruit and customize some of our menu options. The hotel also has a great playground between the Swan and Dolphin for kids. There is a nearby “beach” with sand for kids to play in that borders the lake (no swimming is allowed). Bottom line- this hotel is very family friendly and has fun actives for all ages. Healthy Dining: You have to get a little creative when eating healthy at both Magic Kingdom and Epcot. Most places serve typical fare such as sandwiches, chicken fingers, burgers, etc. However, I found that many did offer fruit, hardboiled eggs, cheese and snack options that were healthy. Sometimes we just ate a bunch of healthy “snacks” for lunch instead of a big meal that wasn’t the healthiest. However, throughout the Disney properties (even restaurants at The Boardwalk) they offered “Mickey Check” meals for kids. These were healthier options for kids but not every restaurant offered these. Some of them were really good and offered fresh veggies and grilled meats. I even ordered some of them for myself a few times! However, they are mostly offered at “table service” restaurants at Magic Kingdom, which is about 8 restaurants (fyi if you want wine or alcohol you have to dine here). It was slightly easier to eat healthy at Epcot since there was more variety because they offer authentic foods from all over the world at the various countries represented in the World Showcase. Epcot had more adult-friendly restaurants (and wine!) – but I found that most are geared towards “foodies” and those that want to indulge a little (which is ok after you’ve walked 5+ miles that day! haha). 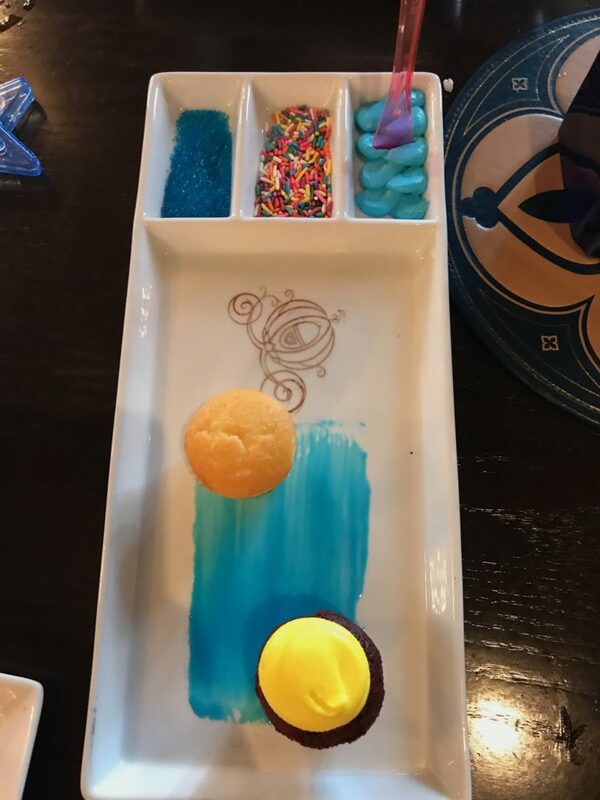 I would highly recommend getting reservations as far out as possible – for all of the theme parks – especially fine dining or table service restaurants. Some people book their meals 6+ months out. You can do this online or via the Disney App. We dined at the Be Our Guest restaurant (MK) last time we went and I had the quinoa salad which was amazing (See Recipe Below). That restaurant was beautiful and worth it just to go see the Beauty and The Beast theme/decor. This time we had lunch at Cinderella’s Royal Table (also at MK) and they offered some nice salads, fruit and other healthy options. Just like regular restaurants – you can customize and ask for no oil, dressing on the side, etc. 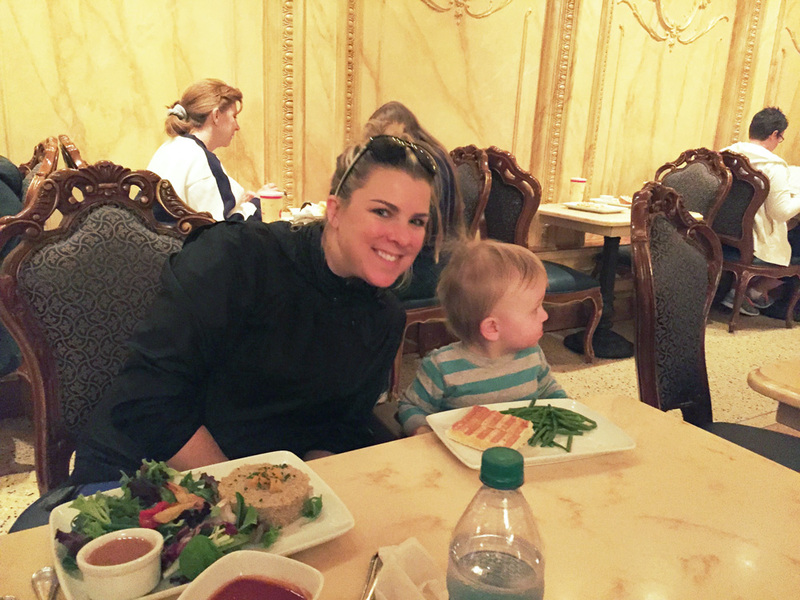 My kids loved Cinderella’s Royal Table – the kids meal was great and almost all of the Disney Princesses visited our table for photo ops! They also loved the cute “make your own cupcake” mini dessert with pretty Cinderella-blue icing. We tried to limit the amount of sugar our kids had (which is hard at Disney) so we looked for very small treats or treats they could share and limited them to once or twice a day. 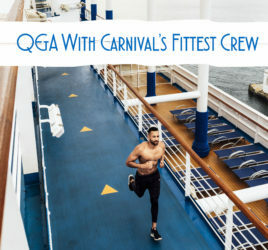 Other Ways to Mix In Fitness: Other than walking…which you will do A LOT of, there are a few other ways you can make fitness a priority. If you want to make your trek around the theme park more of a challenge you could bring a jogging stroller and run some of the way through the property! You can also mix in intervals of fast and slow walking and even find outdoor areas for pushups, tricep dips, etc! You may get some looks – but it might be fun to do your workout at Magic Kingdom! I just got my workouts in at our hotel (see above) each morning. But, once I realized how much walking I was doing, I scaled back my runs a little and focused more on strength training to give my injured knee a break (more on this in another post). Another great way to make your trip to WDW is to sign up for a race with Run Disney! Disney has many races all year ranging from 5k’s to marathons and many that are family friendly and stroller friendly! Once I get back into running marathons I can’t wait to try the Walt Disney World Marathon! Disney also offers training programs too – check it out! Keeping Kids Active: This is pretty easy since most of the time they will want to run around and explore. Also, almost all of the rides make you park your stroller in the stroller parking area and you and your family have to walk/stand in line. It can be hard for little kids to just stand around, so you may want to swap with your partner and one of you take your kid(s) out to play or explore while the other waits in line. Also, there are designated places for kids to play such as the play area inside the Dumbo ride (Dumbo’s Tent), the mini playground outside of the Winnie the Pooh ride (Pooh’s Garden) and lots of other areas in the Frontier Land area of Magic Kingdom. I contacted Disney a couple of years ago when we first went with our son. I was IN LOVE with the Quinoa Salad at the Be Our Guest restaurant, but unfortunately they weren’t able to share the recipe. However, they did send me the recipe for the Quinoa Salad with Hearts of Palm and Shrimp from “Crystal Palace” restaurant in Magic Kingdom. It’s amazing! Cook the quinoa in a large quantity of salted boiling water (4 times the volume of the quinoa – this washes out the slight natural bitterness of the grain) for about 20 minutes. Strain and cool off. Steam and cool off the shrimp. Cut the hearts of palm into ¾ inch coins or half coins depending on size. In a food processor or blender, combine all ingredients for the dressing except the oils. Slowly drizzle in the oil to form the dressing. Assemble everything together in a mixing bowl.